How to Install Solar Pump system? Water pumping asks for a considerable power sink in the daily power utility. When it comes to irrigation a considerable part of the farmable land is far out of the reach of the power lines. Solar Pumps offer a welcome alternative to fuel burning engines, windmills and hand pumps. 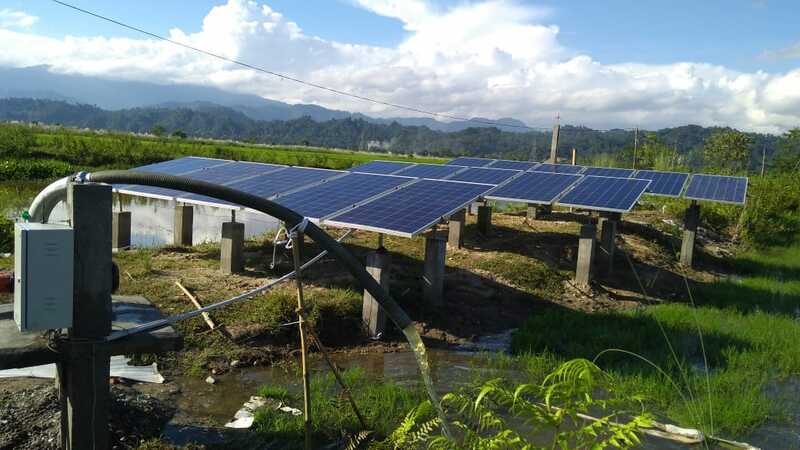 The Solar Pump basically works on solar panels as the power source used to drive electric motors. 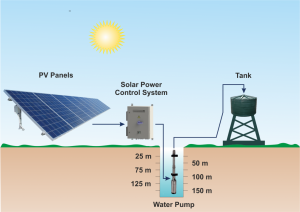 The solar pump system basically consists of three core components. The first step in installation of solar pump system is erection of the structure. The solar panels required to run the electric motor are mounted on the structure. The structure provides a proper alignment of the solar panels with sun. Also the structure should possess sufficient mechanical strength to hold the solar panels against strong winds and hail. The design of the structure depends on the panel configuration that depends on the horsepower of the motor. The second step in the installation of the solar pump. This requires first fixing the pump motor assembly. After the pump motor assembly tape the polyethylene pipe with thread tape and screw it to the pump. Splice the drop cable to the motor cable. Attach the steel safety cable to pump and roll out with rising main and drop cable. Attach the safety cable end to the bore cap allowing for the rising main to stretch. Check the fittings for strength and slack for stretch. Now Lower the pump into the well. The final step is installation of the contoller and integration of the system. The controller is genrally mounted on the main column of the structure. The cables are then connected and checked for loose connection. The controller is then programmed for the motor configurations before finally starting it to run the motor.